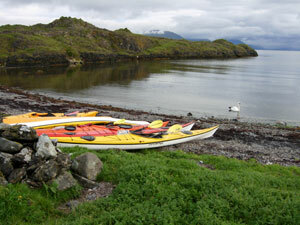 I speak of our latest foray into the world of sea kayaking. Sea kayaking is not an activity that you can simply dabble with, it really does require a certain level of commitment because of the safety factor which can’t be trivialised. The parallels with hillwalking are many: exploring wilderness and nature, physical exertion, navigation and weather awareness etc, but one big difference is the immediacy of danger from the sea versus the hills. Hence, there are a lot more new skills to learn right from the start. For example: capsize recovery and rescue – from the easier assisted rescue, to the difficult self-rescue in choppy waters; kayak rolling (for when you’d really prefer to avoid capsizing); paddling technique; and seamanship (awareness of navigation, tides, weather, safety equipment and procedures etc). With the exception of rolling perhaps, you really need to have a grounding in all of these things before you can even go out for a short paddle in the sea. A bit of wind in the hills has no major impact to a hillwalking outing, but it can seriously challenge a beginner’s paddling skills to the extent of placing the paddler in danger. The disturbing prospect of bobbing around helplessly in Scottish waters whilst (if you’re lucky) clinging to an upturned kayak brings the need for safety awareness sharply into focus. I think it says something about the activity itself that, despite the steep learning curve and the many soakings and occasional disappointments that it entails, we remain undeterred. What other pastime would see us happily plunging into the icy (or at least, quite cold) depths of Loch Eck repeatedly as we perfect our re-entry techniques (meanwhile providing the entertainment for Scottish Power work crews on their lunch break). Or turning back from an area of heavier than expected chop only to put right in again at a more sheltered location, just for the practice. We’d decided that we needed a punt-up on to that learning curve and that it was time to seek professional help. First of all, our friend, Erin, visited us from California in June and we took advantage of the fact that she was a kayaking instructor in a former life by press-ganging her into giving us a crash introductory course. This got us off to a good start and I will be forever in her debt for standing out in the middle of Loch Eck on not the warmest summer’s day ever to supervise us, especially as she was diagnosed with bronchitis the very next day (oh, the guilt!). After several not terribly adventurous sessions out on our own on the Clyde, we then booked a “West Coast Weekend” with the National Kayak School (highly recommended). The weekend started on the Friday evening with initial orientation in the pub in Connel from John, our very competent instructor/guide. We then retired to our tents at the campground near Benderloch. I faced my usual sleeping challenges, but at least they afforded me the opportunity to learn that seagulls still cry at 2.30 in the morning. Delighted to have obtained a quite substantial (for me) 4 hours’ sleep, the morning’s heavy rain did not curb my enthusiasm to get started on our first major (for us) sea kayaking trip. We put in to Loch Linnhe and headed towards the small islands around north Lismore. The water was flat, which suited me fine to start with at least. It wasn’t long before we started spotting wildlife – plenty of seabirds of course, including the ubiquitous oystercatchers and gulls, as well as terns, kittiwakes, cormorants and many others. I soon learned that, along with raptors, I’m going to have to get better at identifying the undersides of seabirds. Then there were seals popping up all around us, as they do when they’re curious, as well as plenty of porpoises swimming nearby. But the highlight was undoubtedly the sighting of 2 otters! I very nearly capsized in excitement never having seen one before. As the rain intensified, there was something quite ethereal about floating silently through the mist with only the wildlife for company. And I hadn’t ever before appreciated the quality of rain ringing on water like so many little bells. It really is another world, a certain nirvana. We stopped for lunch near Rubhaban on the island of Lismore – a somewhat hurried affair as one of our number had recently taken his edging practice that one nano-degree too far and capsized (something not unfamiliar to Alan – yes, I have already saved his life once). Being that it was chilly for August, a state of hypothermia was to be avoided and a quick hot soup under tarpaulin sufficed before a return to some vigorous paddling. Our campsite for the evening was at Achadun Bay on Lismore. The deluge stopped momentarily which allowed us to put our tents up, but was soon back with a vengeance in an on-for-the-night sort of a way. There’s something I love about being “trapped” in a tent, when you’re forced to resort to reading a book, or writing up your journal, or playing cards. An advantage that this scenario has when kayaking versus hillwalking is that you don’t have to fret about not being able to conquer the hill the next day (or at least not being able to see from the top). The rain matters a little less to the sea kayaker’s journey, although it’s always nice to have sunshine. A convivial dinner was spent under tarpaulin once more, expertly rigged by our guide, with the local flock of sheep as our riveted audience. We were rewarded the following morning for our soggy fortitude through the night with something approaching good weather. 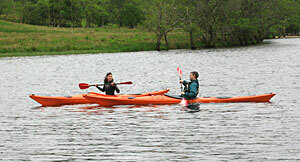 Now, in addition to wildlife, there was scenery as we paddled around the south of Lismore before heading north-east. We came upon a small tide race at the bottom end of the island where we practised gliding across and I found that I seem to favour my right side for strength, perhaps unsurprisingly as a right-handed person. This is something I will have to work on lest I spend the rest of my kayaking career sweeping in anti-clockwise circles only. The wind had increased a little (the forecast had been for no more than Force 3 to 4), and it became slightly choppier, but nothing too challenging, and the tide was eventually with us. My only difficulty was keeping up with the rest of the group. As a novice, it’s hard not to immediately assume that any shortcomings are purely due to poor technique, so I was greatly encouraged when John held back to tell me that I shouldn’t worry about it as I was doing fine compared to “other groups” (I took this to mean perhaps other, more mixed groups, being the only female and being not 20 any more). I do know that there’s a lot of room for improvement in technique just the same and I’ll keep working on it. Like everything in life, practice makes perfect. We hopped ashore for lunch and even had an afternoon tea break, where I learned about the joys of going for a pee in (or rather out of) a wetsuit in a location with very little cover and 5 blokes for company. Fortunately, Alan was there to act as my look-out/screen. The last bit of paddling back to our put-in beach of the previous day saw me (or my arms) running on fumes. There was blood on the paddle as my hands were by this time covered in burst blisters and an earlier fall on to barnacled rocks had sliced them up even further. But I couldn’t have been happier. So despite the rain, the blisters, the sore arms, the inadequate toilet facilities, I had one of the best weekends in a long time. It really does feel like a sea change is occurring, and I am totally hooked. Late to the party, having just stumbled on to your website. But thoroughly enjoyed this article. I just started kayaking back in January and can relate to the insight you share in regards to the steep learning curve. Accomplished my first successful roll this past weekend. Looking forward to reading ahead through your subsequent posts till I get current.